Fall’s arrived, and it’s time to pull out the sweaters, stock the fire wood and get cozy. And what better way to welcome the season than indulging in some of the world’s best food and wine? At the NYC Food and Wine Fest, you can do just that, and rub elbows with stars while you’re at it. New York City’s largest food and wine festival, New York City Food and Wine Fest (NYCWFF), takes place October 11-14. It’s an annual gathering that showcases the creations of celebrity chefs, wine and spirits producers, and more. While the featured recipes are by celebrities, everyone gets the star treatment. The festival consists of 80 different events including luxurious dinners catered by world famous chefs, seminars, and after parties. If you have a love for philanthropy, you’ll have your cake and eat it, too. Every year, NYCWFF raises around 1 million dollars to charities providing food to children in need. You can rest assured knowing your money’s giving back to the community. Between the countless tasting events, posh parties, and philanthropical benefits, where else would you want to take a fall trip? With so many delicious and educational event options, it’s best to plan your events ahead of time so you’re sure not to miss a class with your favorite celebrity chef or an exclusive party. Below are a few of the must-sees to add to your schedule for the weekend. Grand Tastings are exclusive events that feature hundreds of carefully curated wines, cocktails, and dishes. Be sure to stop at one or all of the culinary demonstrations hosted by Food Network and Cooking Channel stars. You even get to leave with a bag of merchandise! Come hungry, and be prepared to be the envy of all your foodie friends. There are 2 Grand Tastings over the weekend. If you’re looking for a full weekend of refined flavors, you can get a pass that will give you access to both events. When’s the last time you’ve taken in the view from a city rooftop while enjoying the world’s finest wine and food? At the NYWFCC, you have plenty of opportunities to. 4, to be exact. Can’t pick just one? Grab a package deal! Coca Cola Backyard Party: If BBQ is your guilty pleasure, be sure to stop by the Coca Cola Backyard Party. The festivities take place on the rooftop of Pier 92 and feature some top-notch BBQ dishes and desserts. Bring the family, because there are games too! Food Network’s Rooftop Birthday Party: End your Saturday evening with a bang and join the celebration as Food Network turns 16! Food Network stars will be serving some of their most famous dishes as you dance the night away. Blue Moon Burger Bash: This all-American burger competition is hosted by your TV favorite, Rachael Ray. Try out 30 of the city’s most acclaimed burgers, and decide for yourself who did it best. Supper is Served: Celebrate the women of the industry and their innovative creations at the Supper is Served tasting party. Enjoy the unique creations of over 25 female celebrity chefs and some unbeatable female mixologists. Whether you’d like to learn a new skill to bring home or to improve on the skills you’ve already built, the NYWFCC classes are the way to go. Attend some of the city’s most high-end restaurants featuring collaborations by world-famous culinary masters. There will of course be plenty of wine, too! Dinners run all weekend, each one featuring a different cuisine style. Whether you’re in the mood for authentic Italian, healthy autumn inspired bites, or classic French dishes, your taste buds are in for a treat. Don’t leave your celebrity lifestyle behind at the festival! Be sure to book a room at one of New York’s finest 5 star hotels conveniently located near the NYWFCC. Located in the heart of Midtown New York, the Nomad Hotel is nothing short of a palace in the city. The interior was designed by famous French designer Jaques Garcia, inspired by the Parisian flat he grew up in. Corner Studio: Endless views come with these corner suites with floor to ceiling glass. You won’t even miss out on the view while you shower, as each corner studio comes with windowed showers. Unique Suite: Each of the Unique Suites offers a one-of-a-kind feature like a 100-foot steam shower or a beautiful private terrace. Terrace Suite: If you’re with a big group or plan to host other festival attendees, consider the Terrace Suite option. It reaches across the length of the building and makes for views of the city from 3 different angles. Owner’s Suite: The Owner’s Suite is located on the 17th floor and has a balcony that spans the length of the building. It comes with 2 bedrooms, 2 bathrooms, and a gorgeous living room, dining room, and kitchen. The Chatwal is located in the New York City theatre district. Its beautiful 1920’s inspired decor makes for a photo-op anywhere in the hotel. You can enjoy kicking back in the upscale lounge, taking some time off at the spa, or even hosting a banquet. New York has far more to see than you could even do in one weekend, but with the proper prioritizing you can have a weekend packed with sight-seeing. The weekend of NYCWFF also happens to be the weekend that Art in Odd Places will be showcasing the art of over 50 female artists all along 14th street. Take a detour from the NYCWFF to spot some of the art yourself. Tickets are available on each show’s website. Grab them in advance to avoid getting stuck with standby! Now that the hard part is over and you’ve determined your schedule for the weekend, it’s time for the easiest part: planning how to get there! What makes it so easy? 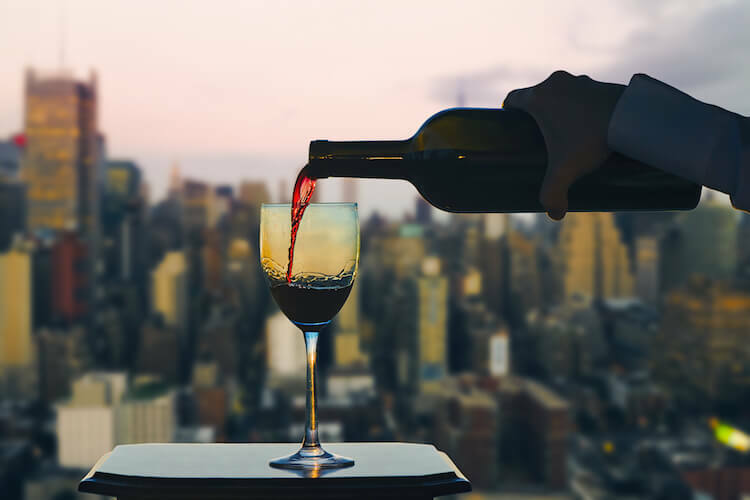 All you need to do is let us know you’re headed to the New York City Food and Wine Festival and we’ll find you a comfortable, safe jet to take you directly to the private and efficient Teterboro airport. From there, you can be picked up in a limo to begin your red-carpet weekend in style. Ready for lift off? Get a quote for a flight and let the fun begin!